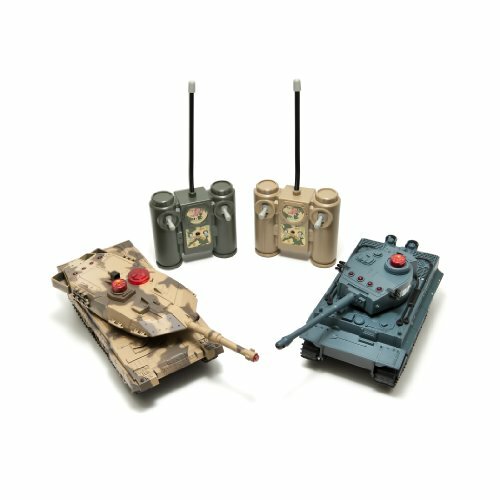 Dynasty Toys Presents Our Premium Remote Controlled Laser Tag Battle Tanks. 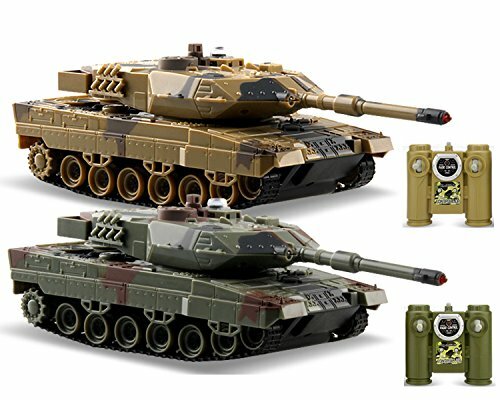 Set Includes 2 LED Infrared Tanks, with 2-Wireless Remotes, Rechargeable Battery Packs and Wall Charger. The infrared (non-visible) lights emitted from the toys are safe for all ages and in conformance with Code of Federal Regulations 21 cfr 1040.10 The toys have been tested by a third-party laser product safety facility and have been determined to emit less than 1mW (.0496mW) power output. The toys do not exceed Class 1 Laser Product Limits. The toys emit a safe and non-visible infrared light, much like the lights used in a garage door opener or tv remote. No eye-protection needed. This product is 100% safe for all ages. The Henglong RC Tank has a full function transmitter that controls this beast as it performs 7-ways movement. It is very powerful and equipped with a high gripping caterpillar, allowing climbing steep slopes that are up to 45 degrees. 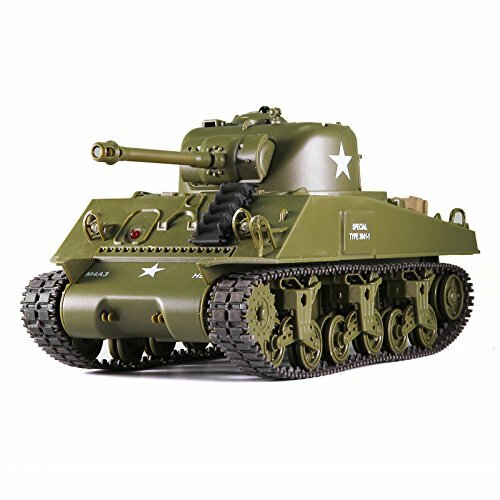 The included transmitter controls all 7 functions of this awesome RC tank. 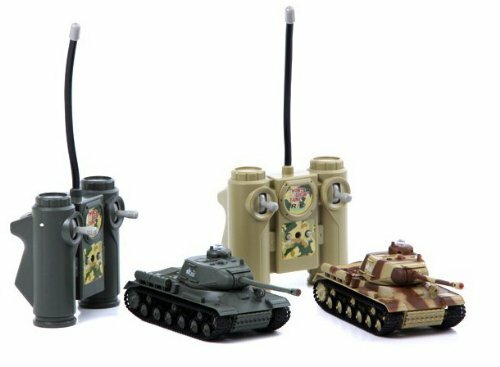 Great gift for tank collectors of all ages! Maximum side turning angel of turret (left/right) approximately 320-degree Maximum vertical turning angel of gun (up/down) approximately 30-degree (manually) Maximum climbing gradient (changeable on different road surfaces) approximately 35-degree Features: 2.4Ghz Full Function Transmitter Realistic Recoil Action Realistic Sounds Supper Chassis and Realistic suspension System Full scale R/C function simulative motor start-up sound, Engine Sound, Machine-gun Sound, etc Working LED Lights Vehicle Features: Rechargeable 3.7v 600mAh Dimensions: 9.25x4.7x3.7(inches) Weight: 1 LB Includes: 1:30 RC Tank Full Function Transmitter User Manual Rechargeable Batteries Accessories Battery Requirements: 3 AA batteries for Transmitter (Not Included) WARNING: choking hazard - small parts. Not for children under 3 yrs. WARNING: LI-ION/POLYMER BATTERIES. Read SAFETY INSTRUCTIONS before use. 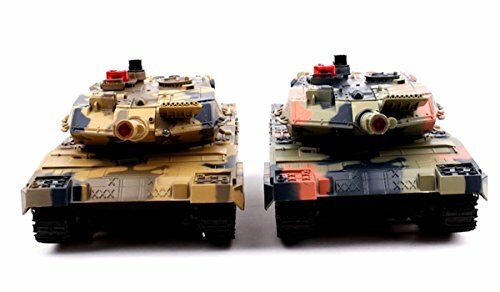 FULL size, infrared shooting battle tanks. TWO tanks and the ability to engage in an incredible realistic battle simulation with a friend! 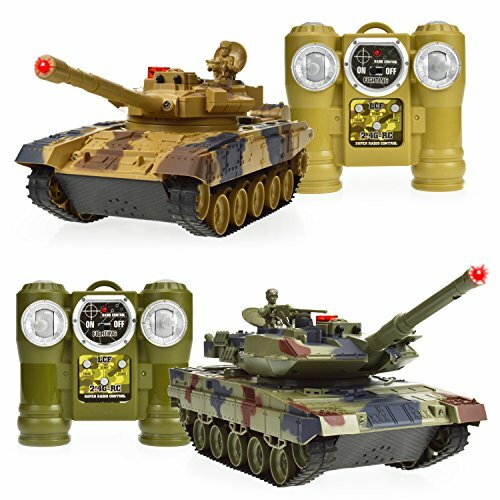 2 Remote Control IR Tanks. Realistic mechanized movement and Infrared targeting firing simulation. You can disable your opponents tank with 4 well placed shots! ?Quality Replica Standard Construction. 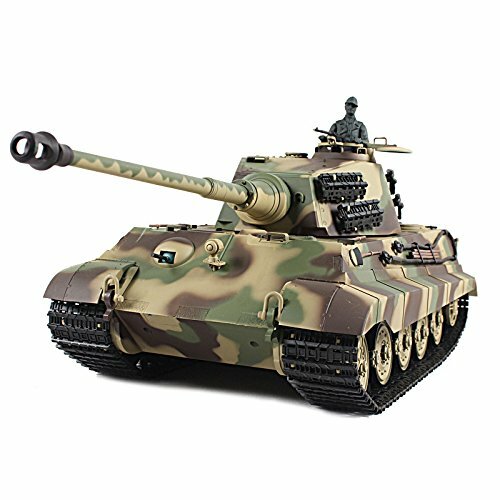 Full Size - Up to 30cm X 7cm X 7cn.Awesome sound effects: Ignition, Engine, Cannon Fire, Machine Gun Fire and Impact. 4 LED Indicators for your "Lives". Every time you get hit you lose a life! Lose three lives and you lose control of the turret, lose four lives and you lose the game! (Reset the tanks to start a new game) Multiple Firing Modes: Cannon and Machine Gun. Package includes: 2 IR Tanks, 2 Rechargeable battery packs and chargers! 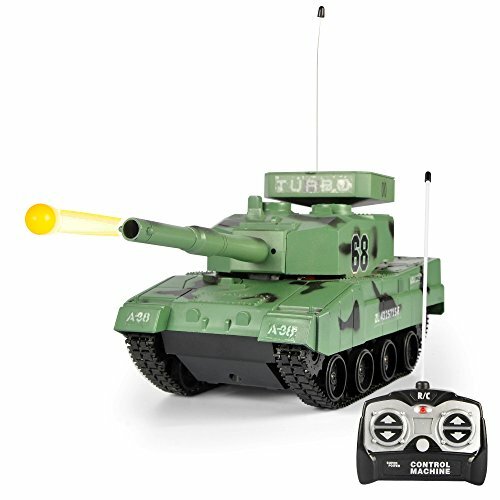 Shopping Results for "Remote Control Infrared Tanks"